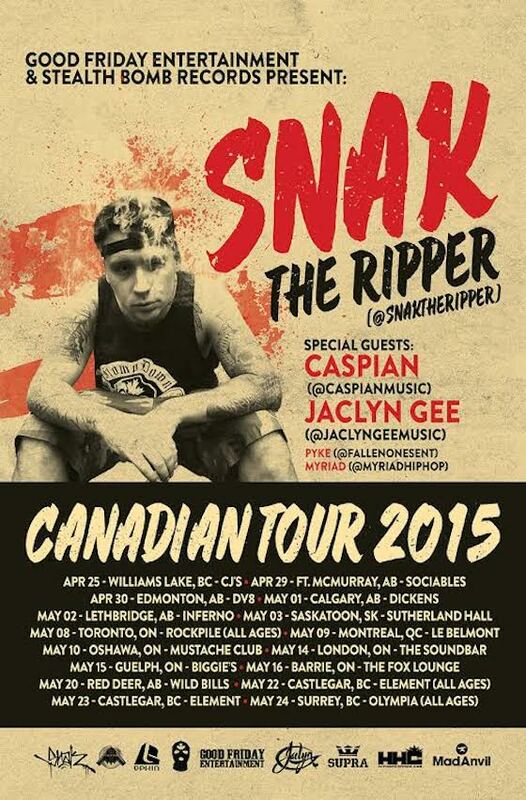 Vancouver rapper Snak the Ripper recently released a new album called Just Giver, and he's taking that Fubar-breathed maxim to heart by givin' 'er hard on a Canadian tour. The run of shows sees our man performing in all sorts of cities and towns through April and May, from Calgary, Toronto and Montreal to Fort McMurray, Lethbridge and Surrey. A press release indicates that Snak will be accompanied by Caspian, Jaclyn Glee, DJ Makeway, Pyke and Myriad for the shows. Check out the full list of tour dates below, and stay tuned for a new Snak the Rapper video set to arrive soon.